Evgeny Svetlanov remains consistent only in his inconsistency. His early Soviet recordings, while hardly the last word in refinement, offered healthy, red-blooded renderings of staple repertoire. But the playing could, from time to time, turn crude and poorly considered, for no obvious artistic reason. The various London-based orchestras with which the conductor has recorded managed to avoid the crudeness, but this more likely testifies to the players' technical expertise and polish than to any orchestra-building skills on Svetlanov's part. 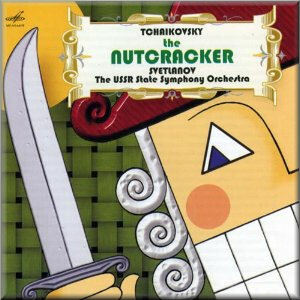 At first, this Nutcracker sounds like it'll catch the conductor's good side. The "Miniature Overture" is neatly played: the upper-string lines are lean, clear, and incisively accented, the winds crisp and perky. The bass note that launches Act I proper lands firmly and gently, with the string ostinatos irresistibly suggesting a narrator settling down to a long story. But, as the sonority expands, the texture thickens and oozes, with some approximate rhythmic coordination. The "home stretch" of Act I is similarly patchy. The climax of the Pine Forest scene (disc 1, track 9, 2:16), heralded by a slightly early cymbal crash, is crassly whacked by sour brasses, in the best Salvation Army manner. But the darting string and woodwind fragments of the ensuing transitional passage evoke a captivating atmosphere. The Waltz of the Snowflakes, though a bit sluggish for dancing, is transparent, with the wordless children's chorus slightly distanced; but the following build-up is heavy-handed and rhythmically square. So it goes throughout the performance: passages of refinement and real insight alternate with coarse ones, which makes for frustrating listening. Aside from this, Svetlanov's tempo sense, as suggested, isn't particularly balletic. He favours broad tempi - save in the 6/8 passage of the Children's Galop in Act I (disc 1, track 4, 1:27), a hasty scamper - which isn't necessarily a problem for home listening. But generally the slower movements land heavily; the phrasing offers little sense of direction. The lighter-textured characteristic dances of Act II, where one might have expected Svetlanov to excel, fall short: with the exception of the firmly accented Spanish Dance, they lack character. Even the big set-pieces have problems. In the coda of the full-throated Waltz of the Flowers, the little fanfares at 6:42 are front, centre, and in the way. And in the grand pas de deux, a too-prominently balanced harp - the engineers favour some old-fashioned spotlighting - reduces the figurations to busywork, spoiling the mood. This may well be the way the Russians heard Nutcracker in the 1980s - although I wonder whether Svetlanov would have gotten better results with the Bolshoi's own orchestra, which plays the music regularly - but that doesn't make it competitive in a well-stocked catalogue. The fifty-year-old Ansermet version (Decca) remains the prize for its gracious phrasing, impeccable balances, and glowing, lucid recording. A later Decca production under Richard Bonynge misses some of the grace, but gains in vibrant richness. Not to be ignored is Bychkov's refined account (Philips), taking advantage of the Berlin Philharmonic's distinctive, translucent timbres. If you must have an authentically Russian version, stick with Rozhdestvensky's capable if prosaic traversal on Melodiya and various licensings.